That's a good price. $7 less than Amazon. I do not believe in taking unnecesary risks, but a life without risk is not worth living. fmerkel wrote: ...Get an IP gauge to check your first stage pressure stability. Any suggestions as to where to get a good IP gauge? I made mine out of a fitting from an old BC inflator and a compressor gauge from Home depot. Works fine. Servicing a reg is as much of an art as a science, and if you find a really good reg tech, stick with them. Price is usually about $30 per regulator (1st or 2nd), plus $30 for each kit to overhaul each one. That makes $60 per reg, then multiple by 3 regulators per diving kit and it's $180. If you have 2 sets, then you're looking at $360. That cost really isn't too bad. If you were to get your car repaired at an auto-shop they'd charge $90 an hour plus parts. Think of it like paying for 2 hours shop time for doing the 2 regulator kits, and the rest in parts cost. I think most people would consider that reasonable. It probably wasn't absolutely necessary to overhaul them but no harm done - you're set for another 1-2+ years. 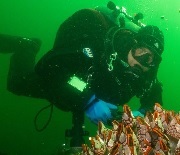 The other option is to learn how to do the overhaul yourself, which is doable and many divers do it. However, it still takes time to learn how to do it, and to actually perform the overhaul. You have to track down the correct parts or substitutes and kits which may not be readily available to DIY'ers. If a person is wanting to go this route, they often purchase regulators they know they can easily get parts for and they don't need propitiatory tools to be able to work on. 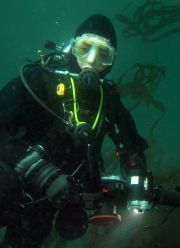 Some people argue that the Regulator is the most important dive equipment to be maintained. 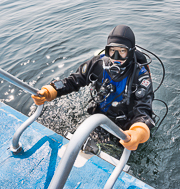 The truth is, your buoyancy compensation and dry suit inflation/deflation are just as important and is often the most neglected dive gear part that leads to diving accidents. Make sure those are cleaned, serviced, and working well. The number of dives on the reg will have little to do with the cost unless something is broken or badly corroded; the same parts and service are performed regardless of whether the reg has a 1000 dives or zero. That said, I also had a hog D1 and two second stages serviced recently. The final price was $170, which I thought was too high. Might as well just buy a new one every few years. Nothing. For that level of use you should have just kept using them. Most regs will go 100+ dives and/or 2+ years of regular use without servicing. Get an IP gauge to check your first stage pressure stability. If the IP is good, the reg is acting fine and you are only diving 10x/year you can probably go way longer between overhauls. I've overhauled regs that had been used hard, put away salty and wet, and sat for years. Looked like hell. Clean inside and still worked properly. When they do need servicing $100-150 is not uncommon for a complete kit. Last edited by fmerkel on Sun Apr 29, 2018 8:59 am, edited 1 time in total. I have two sets of Hog D1 1st stage + Zenith 2nd + Classic 2nd. 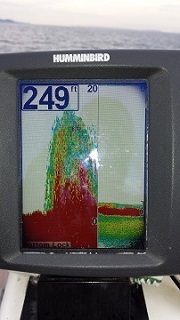 Very low use (20 dives), great shape, very clean, always rinsed, just been sitting for a year or so. I just got a bill for service that was pretty surprising. What should I be paying for service?